The best way to keep teeth and gums healthy is to brush properly. We’ve all heard that many times before. 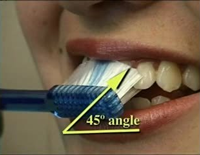 Proper brushing requires a particular technique which ensures effective cleaning of both the teeth and gums. The toothbrush is a necessary tool and is the most important factor in proper brushing. Remember that your toothbrush should have synthetic bristles with rounded ends. It’s better to choose either a medium or soft brush, not a hard one. The reason is that long-term use of a hard toothbrush can cause damage to the enamel and hot/cold sensitivity of the teeth. How big should the toothbrush head be? The head of your toothbrush should be small enough to ensure easy access to your back teeth. How often should I change toothbrush? Change your toothbrush every three months or when it starts to show signs of wear (the bristles are bent outwards). If your brush is wearing out much earlier than 3 months, you are probably using too much force when you brush, and you could be damaging the enamel on your teeth causing hot/cold sensitivity. If you continue to use a worn-out brush, your teeth will not be cleaned properly and are in danger of damage. Brush your top teeth separately from your bottom teeth.Hold the brush at a 45° angle to your gums and brush gently with circular movements either up and down or horizontally so as not to cause gum or teeth sensitivity. If you’re right-handed, start from the top left, moving to the right, then to the inside right and then to the inside on the left. Repeat on the bottom teeth. If you’re left-handed, start from the top right. Finally, brush the chewing surfaces of your teeth. Ideally, after every meal and especially after eating carbohydrates (foods containing sugars). However, if you prefer to brush your teeth once a day only, it’s best to brush before going to bed. During the night, teeth decay 3-times faster than during the day because of reduced saliva production. Due to its antimicrobial action, saliva works to protect your teeth. 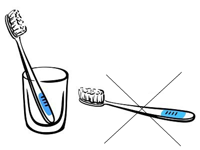 70% of food residue is removed from your teeth only by brushing with water. Toothpaste is used mainly as an encouragement to brush, to freshen our breath and to give the feeling of a clean mouth. The amount of toothpaste you use should be about the size of a small pea. Can I share my toothbrush? Every toothbrush carries microbes from its user. So, it’s better not to share. Where should I keep my toothbrush? 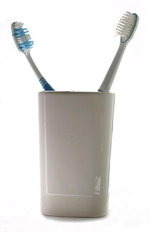 Between brushings, your toothbrush should dry and be kept in a glass with the handle pointing down and the brush up. The whole procedure should last at least 3 minutes. It should be noted that research has shown that most people spend an average of only 30 seconds to brush their teeth. Many are in a hurry and forget to brush the back teeth and the inside of their teeth. This is a mistake since that food residue that will remain on these surfaces can easily cause tooth and gum decay. Flossing after brushing is considered necessary since it’s the only way to remove food debris and destructive plaque from spaces between teeth, or where your toothbrush can’t reach. Is nutrition associated with healthy teeth and gums? The over consumption of sugary or acidic foods (e.g. carbonated beverages), especially between meals, helps the growth of bacteria and the development of decay. In addition, the reduced intake of certain vitamins (vitamin C, for example) is associated with increased frequency of gum disease. Is prevention even better than the cure? Regular visits to the dentist (once-twice per year) as well as when any small dental problem is identified are recommended. Regular visits serve not only for early diagnosis and treatment, but also for a general check-up of your mouth cavity. The cost of dental prevention is always lower than the cost of the treatment.